There is serious concern in the telecommunication industry that the transmission capacity limit may be reached in the near future. One reason for this is the fiber fuse phenomenon, which is the continuous self-destruction of silica glass optical fiber induced and fed by propagating light. This phenomenon imposes an inevitable limit on the light power that can be handled by a fiber and prevents us from increasing the transmission capacity growth of optical communication. 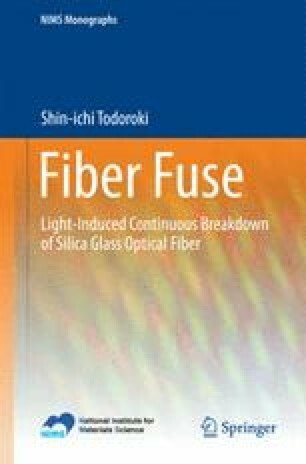 This chapter briefly reviews the basics of silica glass optical fibers and the fiber fuse phenomenon. The initiation of a fiber fuse is caused by the generation of a thermally decomposed product of silica glass. Its high absorbance results in a confined plasma (or optical discharge) propagating along the fiber core. This is due to the excellent heat resistance and low thermal conductivity of silica glass.